How Much Does a New Follower Cost on Twitter? That’s what I wanted to find out. I’d never ran a Twitter ad before. You can run ads for more than just new followers, you can also do it to drive more engagement (retweets, favorites, and clicks). I wanted to experiment with gaining new followers. I’d had experience running Facebook ads before for new Likes and Google Adwords for page clicks. I was familiar with setting a budget, identifying a target audience, and crafting the ad text. This was no different. The first step is choosing @usernames. This was an ad for @skinnycoco so I targeted two of it’s competitors as well as “users like our followers”. The latter means similar interests and demographics. You can add multiple usernames and even exclude usernames you don’t want to target. Like Facebook ads, doing the above step gives you an estimate of reach. In my case it was 7K. The next two steps allow you to choose interests by browsing categories and to choose locations. I chose not to choose a category and chose United States. The most important aspect of creating the ad is the text of the ad itself. You can either choose from an existing tweet or create a new tweet. Anything you could post under a normal tweet can be posted here (ie. text, picture, or link) in addition to “cards”. Twitter Cards allow you to attach rich media experiences to tweets about your content. If you’ve ever seen a longer post with text, image, and a call to action underneath, that’s a Twitter Card. These cards can be used at your promoted tweet in your ad. I budgeted $20 to see how much each new follower would cost, on average. 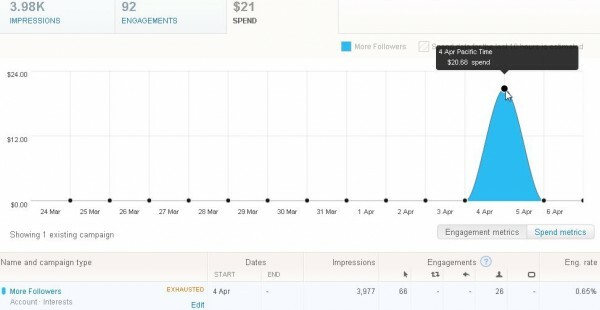 For $20 I got 3,977 impressions (views), 66 clicks through to the Twitter profile, and 26 new followers. That translates to $0.77 per like and an engagement rate of 0.65%. What Could Improve Those Numbers? The first thing I would change would be to try different tweets and run them at the same time to test engagement. I didn’t realize that you could, like with Facebook and Google ads, run multiple ads on a single campaign. If I do it again, that’s what I’ll do.